The opioid crisis, the frequent mass shootings, the rising rates of suicide, especially among middle-aged white males, the morbid obesity, the obsession with gambling, the investment of our emotional and intellectual life in tawdry spectacles and the allure of magical thinking, from the absurd promises of the Christian right to the belief that reality is never an impediment to our desires, are the pathologies of a diseased culture. They have risen from a decayed world where opportunity, which confers status, self-esteem and dignity, has dried up for most Americans. They are expressions of acute desperation and morbidity. A loss of income causes more than financial distress. It severs, as the sociologist Émile Durkheim pointed out, the vital social bonds that give us meaning. A decline in status and power, an inability to advance, a lack of education and health care and a loss of hope are crippling forms of humiliation. This humiliation fuels loneliness, frustration, anger and feelings of worthlessness. In short, when you are marginalized and rejected by society, life often has little meaning. 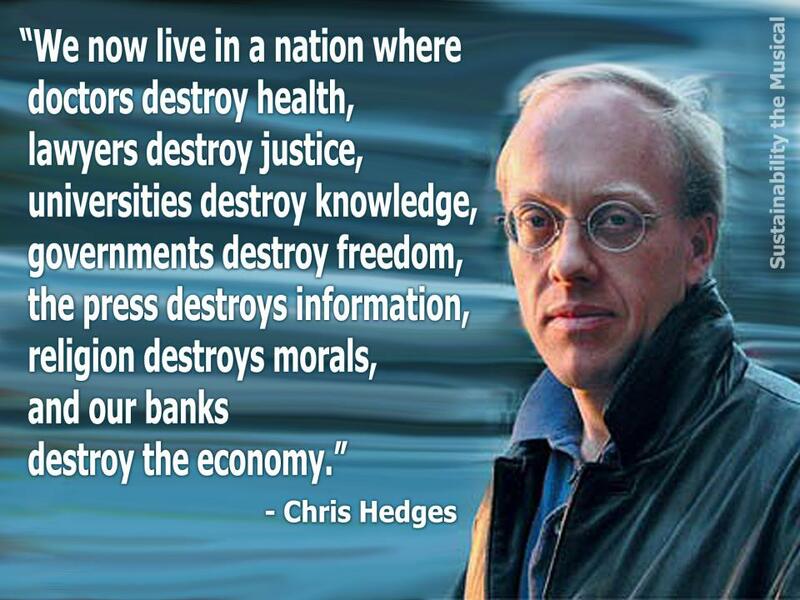 As you can guess from some of the titles, Chris Hedges is the son of a Presbyterian minister who, himself, attended Harvard Divinity School. As a war correspondent, he won the Pulitzer Prize for journalism. If you want to know what is wrong with this country, you can either wear a red hat that promises to make American great again, or you can use your brain and get a better idea of what is going on behind all the political spectacle. This entry was posted in politics and tagged chris-hedges. Bookmark the permalink. …..all the fruits of Empire.